Brazilian President Dilma Rousseff prepares for a long and bitter battle with a deeply fragmented Congress after impeachment proceedings were introduced against her in the lower house on Thursday. Speaker Eduardo Cunha introduced impeachment proceedings Wednesday evening, citing a court's finding that Rousseff's administration violated fiscal responsibility laws by using money from state-run banks to fill budget gaps and pay for social programs. Rousseff's Workers' Party has indicated it will argue before the Supreme Court that Cunha exceeded his powers as house speaker. A special commission of 66 members of the House of Deputies, with representatives from all political parties, will be formed to decide whether impeachment proceedings should go before the full lower house. Analysts said the impeachment proceedings will likely make it out of the commission, but seem unlikely to get the needed two-thirds vote in the full house. But if impeachment does pass the House, Rousseff would be temporarily removed from office for up to six months, her vice president would take over, and the Senate would then decide whether Rousseff should be permanently removed. Permanent removal would require the support of two-thirds of senators. Rousseff, who has the lowest poll ratings since Brazil's return to democracy in 1985, sharply rejected any wrongdoing. "I've committed no illicit act. There is no suspicion hanging over me of any misuse of public money," the president said in a national broadcast speech late Wednesday. Cunha's Brazilian Democratic Party is the strongest partner in Rousseff's ruling coalition, though Cunha and some other members have clearly drifted away from her in recent months. Members of the opposition backed Cunha's impeachment effort. "It is not a coup. We are talking about a mechanism that exists in our Constitution," said Sen. Aecio Neves, who narrowly lost against Rousseff in last year's presidential election. The timing couldn't be worse for the leader of Latin America's largest economy. Brazil is facing its deepest economic downturn since the Great Depression as consumer demand and commodity prices have plummeted, and a sprawling kickback scandal at state-run oil company Petrobras has cast a pall over the entire business community and frozen investments. Brazil's economy is expected to contract more than 3.5 percent this year and again be in recession next year. That could be a wild card for Rousseff as she fights for her political life. 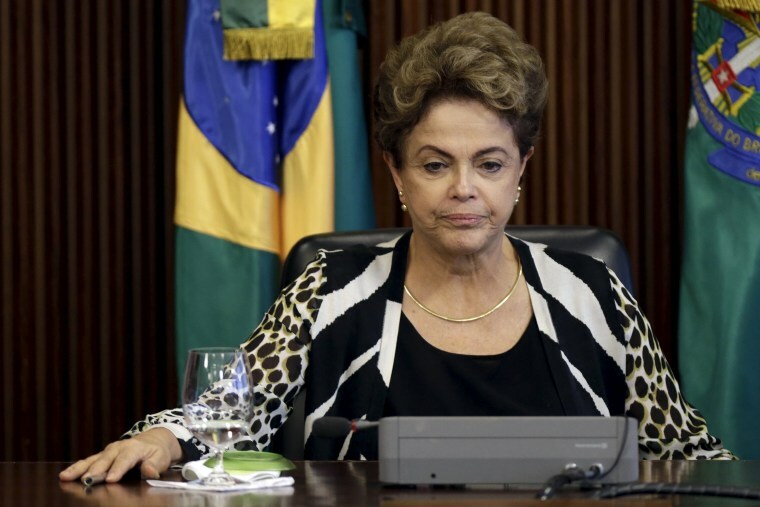 "President Dilma Rousseff, who began in such a gloomy state less than a year ago, is now facing dark days. The outcome is unpredictable," wrote Eliane Cantanhede, a political columnist for Estado do S. Paulo. "She may or may not survive."